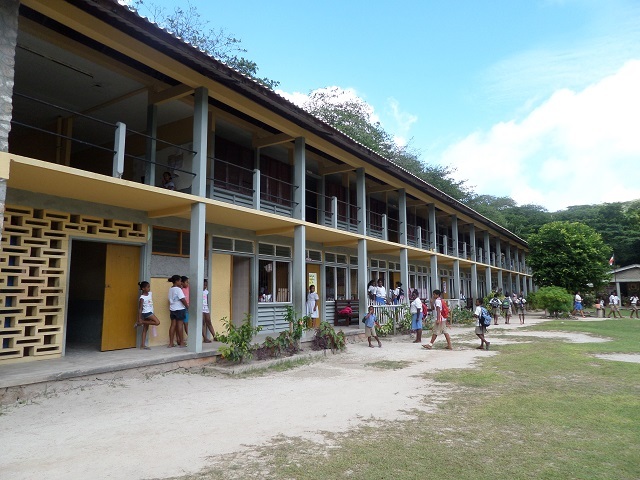 (Seychelles News Agency) - The bell chimes and the school children who were playing under the huge breadfruit tree standing in the middle of the school compound rush past each other to get inside their classrooms with vented windows. While they hurried to their seats, a few of them dumped their empty snack wrappers of plastic and paper bags in several waste containers outside of their classrooms. These will soon be sorted and organic waste will be used as compost in the garden. 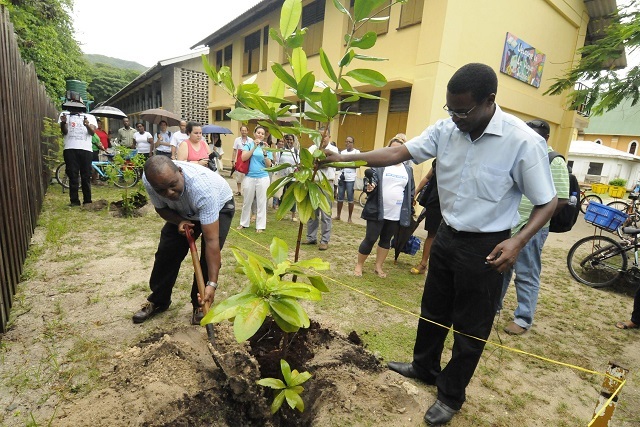 That is all part of the La Digue School's initiative to encourage its student population of a little over 200 to adopt a more eco-friendly approach in every aspect of their school life. Since last year, the school on the third largest inhabited island of the Indian Ocean archipelago has been receiving the help of various partners which include government agencies as well as non-governmental organisations. 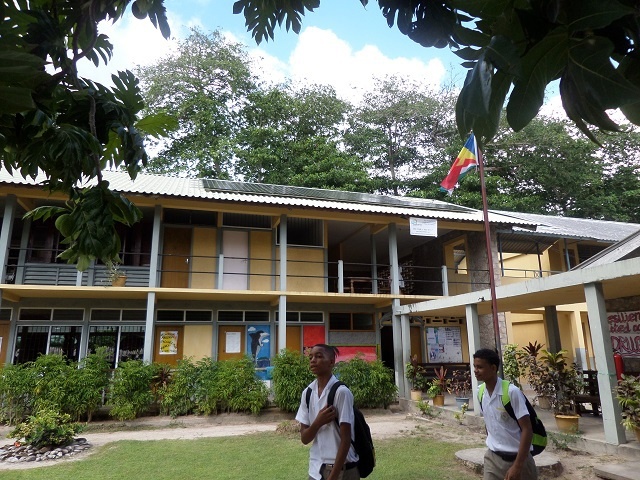 “We also have installed a rainwater harvesting system that is used in the toilets while we are vigorously working on a plan to increase the number of trees in our school compound,” Ian Collie,the principal of La Digue School, explains with pride. The most recent initiative of the only educational institution for primary and secondary students on the island of nearly 3 thousand inhabitants, is an ambitious project to rethink their use of energy. 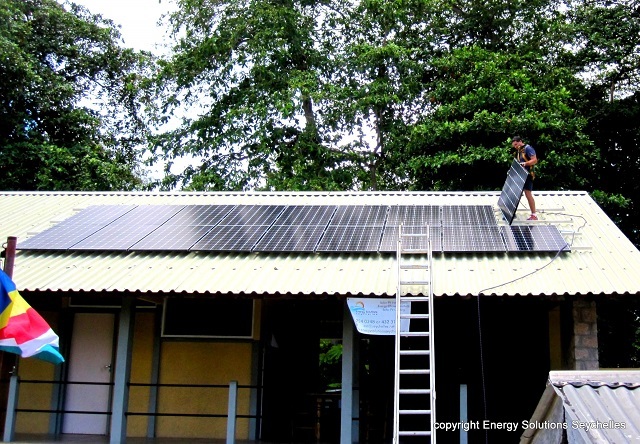 To this effect, a first roof top grid tied photovoltaic system has been erected on one of the school's buildings, a first for the island reputed for its tranquillity and laid back way of life which attracts many tourists, in its bid to go all green. “On average our [electricity] cost amounts to over 20,000 Seychelles rupees a month [about $1600], which is a lot. We already have five and when we get the other eight photovoltaic panels providing solar energy it will help us a lot….our bill will be reduced by at least eighty percent,” said Collie in an interview with SNA. All of these eco-friendly measures have been put in place by a small committee comprising of teachers and school children themselves who hope to become leaders in revamping the way the island makes use of renewable energy sources. Apart from local partners the school has also been receiving the help of international organisations like the Clinton Climate Initiative, a non-profit foundation led by the former United States President, Bill Clinton, that has been working on several islands of the Indian Ocean archipelago for the past three years. Fiona Wilson, the representative of Clinton Climate Initiative, says that since April they have been meeting and discussing ideas on how to improve the use of energy and a wholesome approach to revamping energy usage at the school. “It was nice to see that the school was already doing that. 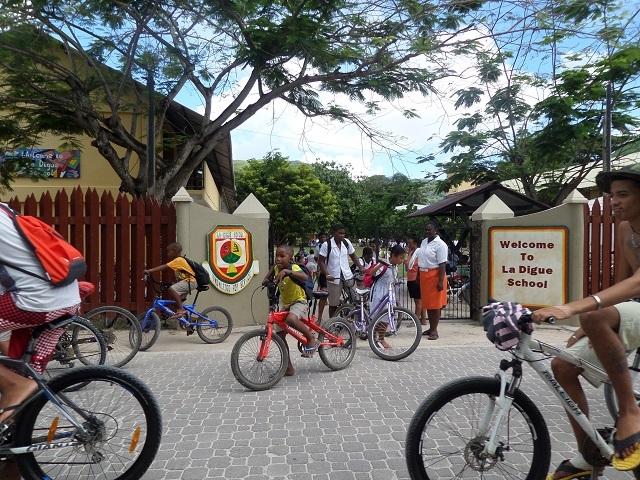 So we helped them create sort of a long term sustainability vision under our community resilient programme,” Wilson told SNA, adding that the students are very active in the project. The project gained momentum as the school tried to enrol for the Zayed Future Energy Prize, an annual international competition for educational institutions which apply innovative solutions in the face of climate change and other global environmental challenges. Unfortunately, the school was not short-listed after the first round of the competition which also saw others countries on the African continent apply for the prestigious prizes on offer. Undeterred by the result, the head of the Seychelles Energy Commission who oversees the implementation of renewable energy projects in the island nation, Tony Imaduwa, says this will allow the school to work harder for another application next year. “We have room for improvement and having not qualified this year will push the teachers and students to work harder in cultivating their own garden of which the produce can be used in their canteen...and other energy programmes such as use of bio gases, etc,” Imaduwa told SNA, adding that they will be further assisting the school to implement other projects including to make their computer room more energy efficient. La Digue has recently, with the expertise of the Indian Ocean Island Commission, started to draft a five-year plan in order to achieve 100% green status by the year 2020. A vision that is slowly being shared by other inhabited islands of the Seychelles such as Cousin island, Aride island and the atoll of Aldabra which are completely also reliant on solar energy. 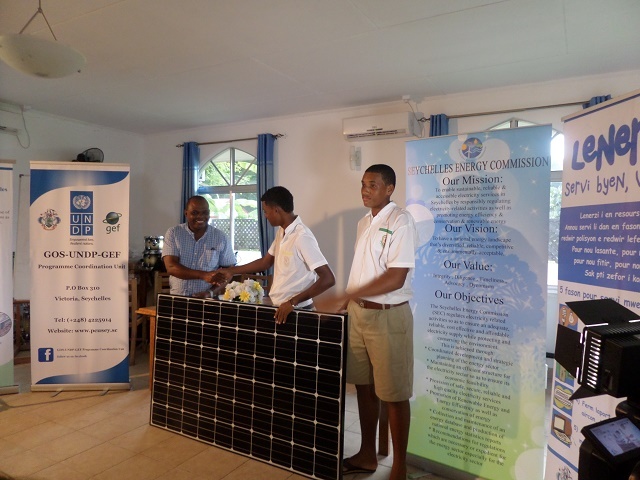 La Digue has been in the limelight when it comes to renewable energy for the past 5 years. During the Expo 2020 organised 25th March to 6th April 2011, that the Seychelles President James Michel announced the 2020 vision of making Seychelles the eco-capital of the world and La Digue the eco-capital of Seychelles. Since then various initiatives have been undertaken to transform the island with a population of around 2,900, into the country’s eco-capital, including the introduction of clean energy vehicles.